This is definitely my kind of book. It is Trevor's treasure trove of trivia about Irish football managers. Gaffers goes back to the former Manchester United captain Johnny Carey in 1955, through every manager right up to Giovanni Trapattoni. Actually, on second thoughts, Gaffers is much more than just a compendium of statistical facts and figures. It is a very well crafted treatise on every Irish manger with lots of interesting background information and details. Although the book hangs together beautifully and has a natural flow it can also be selectively dipped into and each chapter can be accessed individually as a standalone. Having read Gaffers it made me realise how deficient the Republic of Ireland managers section of this website really is - not to mention one or two factual errors that I've made. Trevor Keane seems to have conducted a huge amount of research for this book, including getting his hands on the only known surviving copy of Ireland: on the Ball written by Donal Cullen (who is also the author of Freestaters another excellent reference book). The author conducted more than 55 personal interviews with all of the key personalities and those that knew them best. If you have an interest in statistics about Irish football this book is a must. Keane lists the details of every single football match played by the Republic of Ireland going back to Johnny Carey's first match against Spain in November 1955 right up to the match against Algeria in May 2010. Each manager's record details; opponent, result, score, type of fixture, biggest win, biggest defeat, and longest run without defeat. Keane also produces win, loss & draw ratios. Keane's research and analysis will go a long way to settling arguments and debate amongst Irish football supporters about who was the best Irish football manager ever, and it may even generate new issues to argue over in the pub. Gaffers is a thoroughly enjoyable read as well as an outstanding Irish football reference resource. For anyone that has even a passing interest in Irish soccer this is a must-have tome for your bookshelf, bedside locker, coffee table or the loo. 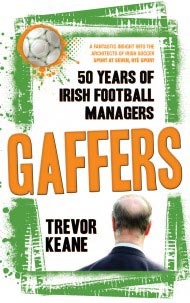 I thoroughly recommend Gaffers: 50 Years of Irish Football Managers to all football fans. Part of the proceeds of each book sale will go to the Diabetes Federation of Ireland. Trevor Keane who lives in Kilkenny, has a BA in Accounting and Finance and works in the financial services industry. He has more than five years experience of football writing, in both digital and print formats. He has contributed to Tribal Football, Soccerway, ITV football and Sportingo. He has also featured on Anna Livia radio with a show was called "Tracks and Field", where Trevor interviewed sports people about music, and music people about sport.